The Royal Australian Navy has commissioned a Bereavement Pin to recognize the valued contribution of all Navy personnel who lost their lives while in the service of the RAN, and the nation. 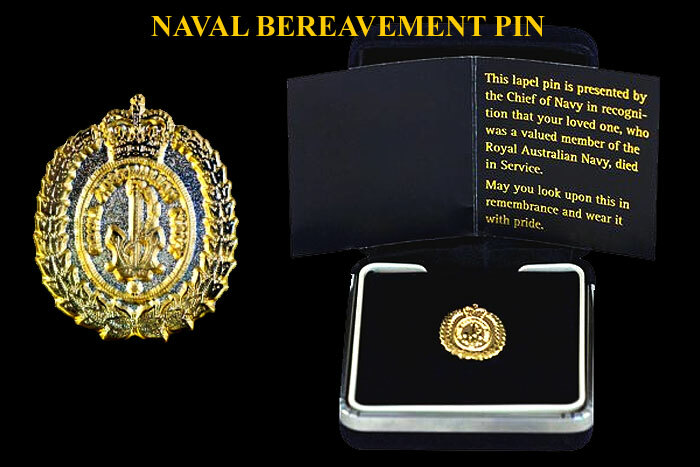 The Navy Bereavement Pin (NBP) is a distinctive 20mm gold lapel pin which has the crest of the Royal Australian Navy encompassed by wreath 'supporters'. The NBP has been developed to meet an expressed wish by many families, who have lost a close family member while they served in the Navy, to have a tangible yet discrete memento of the service of their loved one. The NBP is a symbol that can assist family members to commemorate the life and service of a relative who was lost while serving in the Navy. To date, over two thousand NBP have been provided to descendants and family members of Navy personnel. Of note, Navy Bereavement Pins have been issued to family members of some of the earliest RAN wartime casualties which occurred during World War One, as well as the families of Navy personnel who have died in service more recently. It is the Chief of Navy’s wish that, by prominently wearing the NBP, or having it as a special keepsake, the Pin will assist relative to remember proudly a family member who lost their life while serving in the RAN. b) the applicant, and any other persons included in the nomination, is/are related to that Sailor or Officer. All family members of Royal Australian Navy personnel who died while serving in the Navy, since Federation, during war or peace, on active service, or even off-duty, are eligible to receive the NBP. Eligibility extends beyond immediate family and may include members of an extended family. Please allow up to five to six weeks for your nomination to be processed. Your NBP will be mailed to you. Relatives without internet access should call the Navy Bereavement Pin Information Line, (02) 6265 3383, for an application form.